Read an excerpt below from Leading Age's article in which members of the Dining Services Committee at Lenbrook speak about the importance of having a good dining program. Lenbrook’s resident dining committee is quite involved with the many healthy and delicious options offered by Executive Chef Todd Clements and his culinary team. The life plan community has 4 distinct dining venues: The Bistro, The Grill Room, Lenbrook’s Fine Dining, and Tim’s Terrace. 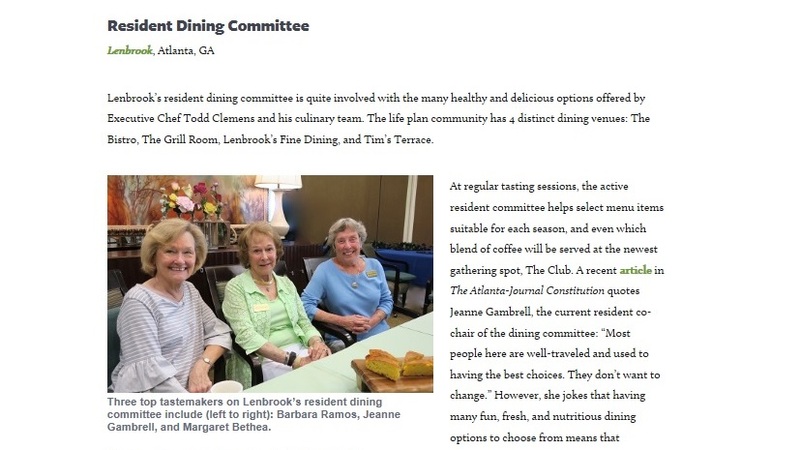 Three top tastemakers on Lenbrook’s resident dining committee include (left to right): Barbara Ramos, Jeanne Gambrell, and Margaret Bethea. According to the AJC story, “Lenbrook’s Resident Dining Committee also played an important role in finally helping to resolve a long running—and somewhat amusing—argument over cornbread. Lenbrook’s 500 residents have roots around the country and generally speaking, Northerners prefer a sweeter cornbread recipe and Southerners a more savory one.” These days, both are available, though Clemens sometimes adds a jalapeno cornbread muffin as well.